Since the 1600s, the immigrants who came to this country - my country not by birth but by choice and lawful naturalization - built roads, bridges and tunnels to keep themselves connected with others. They worked hard, settled in, and established deep roots while seeking the stability, freedom, and opportunities that their own countries didn't have. It's arcane, not to mention outlandish and yes, childish, to hear the current government lay out plans to build a wall in the border with Mexico. Like the Berlin Wall? Like the one that separates Israel and the West Bank? Covering 1,954 miles of land? With my money? Seriously? So it was quite timely from a historical and cultural perspective to have visited Mexico City this past week in the context of Zona Maco, which was created in 2002 and has grown to become the biggest art fair in Latin America. While I have traveled extensively in Mexico, I had not returned to the "DF" since the 90s. And I was positively impressed and very happy to have reconnected with that colorful city. Tuesday night was the opening of the local gallery shows. The spaces were impressive, the streets filled with people, and mariachis played on sidewalks. ProyectosMonclova is housed in a stunning building with double-height ceilings and two floors overlooking lush gardens in Colonia Roma. Two shows opened that night: Crooked Bazaar, on the first floor, is an exhibition of works by Gabriel de la Mora, Sam Moyer, Andreas Slominski, Martin Soto Climent, Eduardo Terrazas, Roberto Turnbull and Ana Virnich that looks to consider the future of painting in the context of non-traditional materials like yarn, rubber pads, beads and garage doors. The second floor's show DOBLE FONDO [FALSE BOTTOM] by the collective Tercerounquinto takes their research into public space and its visual languages with an investigation in urban political history: the popular unrest or how to fight the everyday of structural constrains. Nearby, Galería OMR had the opening for "The Queen Falls" - like the last act in Hamlet, where the name of the show comes from, it also symbolizes a chess move, where the pawn could win. It's surprising and invisible to the naked eye, and that's what the show wanted to accomplish - new moves that are unpredictable but sometimes feel familiar. The gallery itself, with three floors, terraces and massively high ceilings, is worth seeing in person. The show had works by Ugo Rondinone, James Turrell, Jose Dávila, Alicia Kwade, Gabriel Rico, Tatiana Trouve and others, both inside and outside. Like Hamlet’s ghost, the works were a reappearing narrative that kept reinterpreting itself by the viewer and by the context itself. 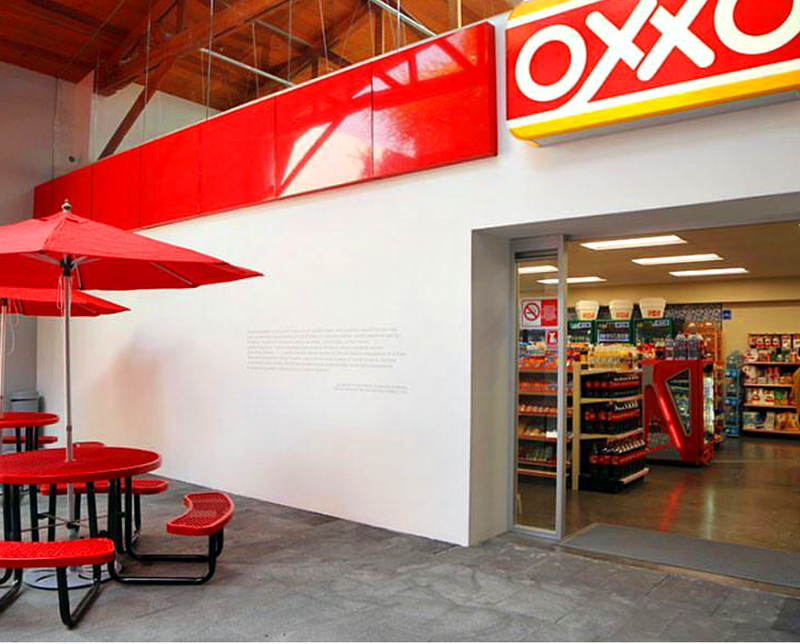 Kurimanzutto, which is in San Miguel de Chapultepec, was turned into an OXXO bodega-supermarket (OXXO is the biggest supermarket chain in Mexico with more than 14,000 stores in the country) by no other than the most high-profile living Mexican artist, Gabriel Orozco. “OROXXO” was filled with products which Orozco had intervened, looking to expose the situations that have led people to have more access to art and artists but less possibilities to acquire art. 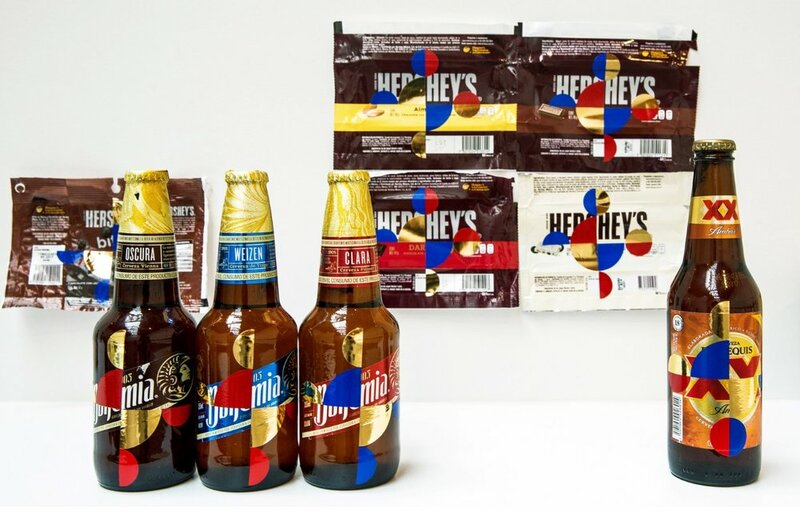 The exhibit also commented on how artists are becoming names of mass consumption, with galleries operating in the same way transnational companies get their products across markets all over the world. Museums abound in Mexico City - historical, impressive settings impossible to see in three and a half days. (The traffic in the capital is horrific, but everything else makes up for the hours sitting in Uber cars.) The Anahuacalli Museum was commissioned by Diego Rivera to display his collection of pre-Hispanic objects and ceramics, but he died prior to the conclusion of the construction and it was finally inaugurated in 1964 with the help of Diego’s friend and patron of the arts, Dolores Olmedo. 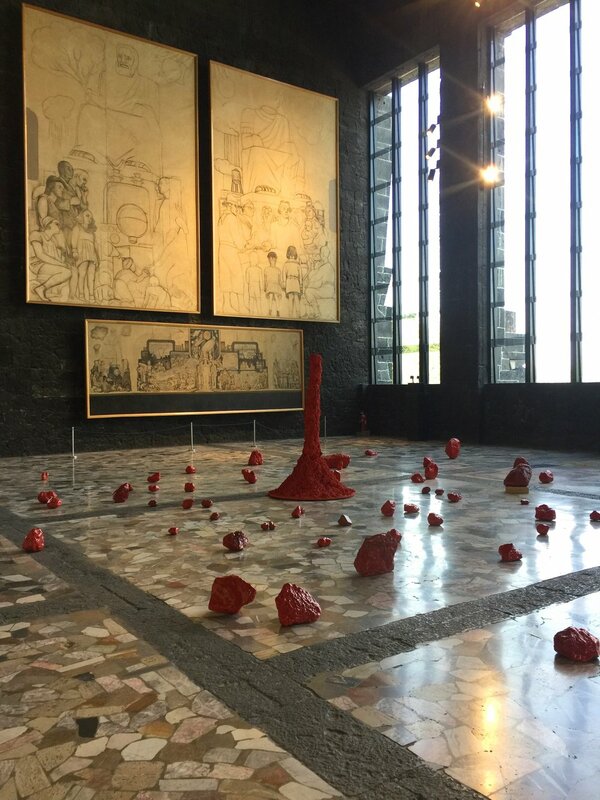 The current show at Anahuacalli is Bosco Sodi’s “Elemental,” an exhibition where the artist created a series of sculptures using clay and volcanic rocks juxtaposed against the monumental building, bringing to the surface the existence of life itself. The Frida Kahlo Museum, or “La Casa Azul” is the house where Frida was born and where she died. Although she lived in different places with Diego Rivera, she always came back to this magical color-saturated house in Coyoacan. The art collection itself is modest (Frida only painted 143 canvases, and what is left in public collections isn’t a lot), but it has some very iconic pieces like Viva la Vida (1954), Frida y la Cesárea (1931) and Retrato de mi padre Wilhem Kahlo (1952). Her own studio and the last wheelchair she used before passing are in the same position she left them before dying. The internal gardens of the house are strangely arid but lush at the same time, and the yellow and blue walls surrounding them add to the surrealist scenery. On the more contemporary side, the Museo Jumex had a great retrospective by the Canadian Collective General Idea. The works and installations spanned two floors and are as relevant today as 25 years ago when many of them were made. Topics ranged from the AIDS epidemic to fake news and media manipulation. Brilliant. Casa Luis Barragan is another obligatory stop and of all the places I visited, the only one that felt intimate. 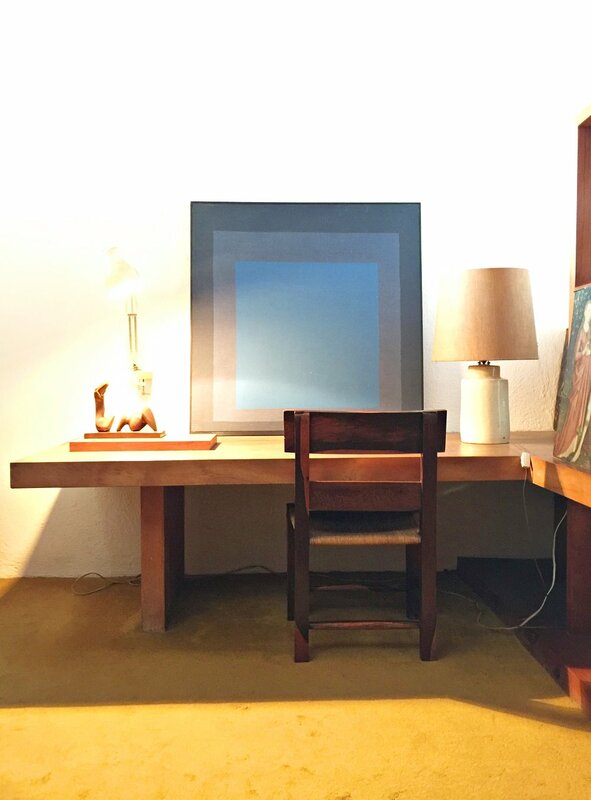 Barragan was one of the most influential Latin American architects of the 20th Century, known for his use of bright colors and the seamless mix of Mexican architecture with very avant-garde elements. The house was built in 1948 and remained his residence until his death in 1988. I loved his art collection, how much pink is on the walls, as well as the constant play with light, angles and gazing balls that enlarge perspective and trick the eye into expanding the space. 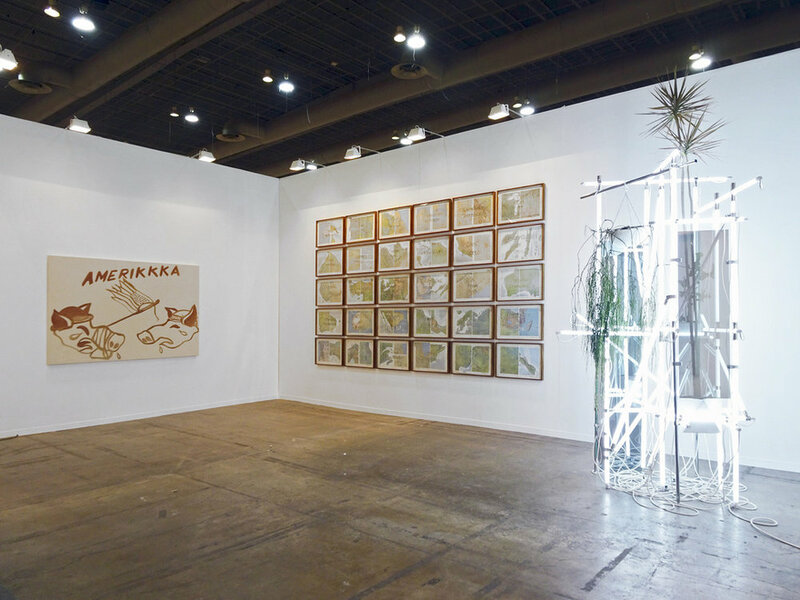 Zona Maco itself is relatively manageable (compared to Frieze or Art Basel, for example), with around 120 galleries both local and international, a selection that is truly phenomenal and with some very strong curatorial positions. 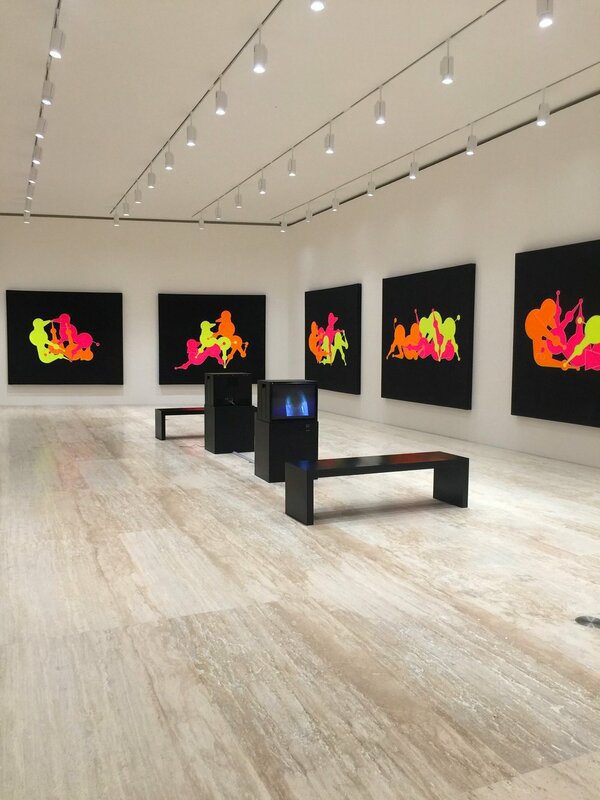 Zwirner, Gagosian, Perrotin, Gladstone, Lisson and many big names show there. Smaller New York galleries like Henrique Faria had a most brilliant solo booth showing the works of Humberto Marquez, a fictional artist, created by two other artists: Emilio Chapela and Plinio Avila. Marquez, the invented artist, looks back in Mexican history (and Latin America in general) and creates seals and stamps where drugs and guns replace the faces of national heroes, the words "America Para Los Latinoamericanos" are the sign of demagoguery and empty promises on a large framed print, sculptures imitate the shoe boxes of a brand called "Canada" (very apropos given that NAFTA seems to be pending from a thin thread), and Coca-Cola crates are also in a corner looking strangely conspiratorial. Everything is fake, except the art pieces themselves, because even the invoices or certificates of authenticity will bear the name of an artist that doesn't exist. Curro, a gallery from Zapopan, Jalisco, also made a strong point by exhibiting a piece of Juan Capistran (who is Mexican-American) and showed the word "Amerikkka" with two crying pigs on each side. The KKK was conspicuously noticeable. Kurimanzutto made a statement with one of the outer walls of the booth which had a mural that said "Menos Petróleo Mas Valor" (Less Oil More Courage) by the Argentinian Rirkit Tiravanija. Oil prices have dwindled while Trump has threatened Mexico with sanctions. The statement is as valid for Mexico as it is for any oil-driven economy that has relied on natural resources at the expense of not strengthening other economic areas. Politics aside, I loved the installation "Malos Pasos" (Bad Steps) by Mexican artist Gustavo Artigas, shown with Guadalajara's gallery "Tiro al Blanco". 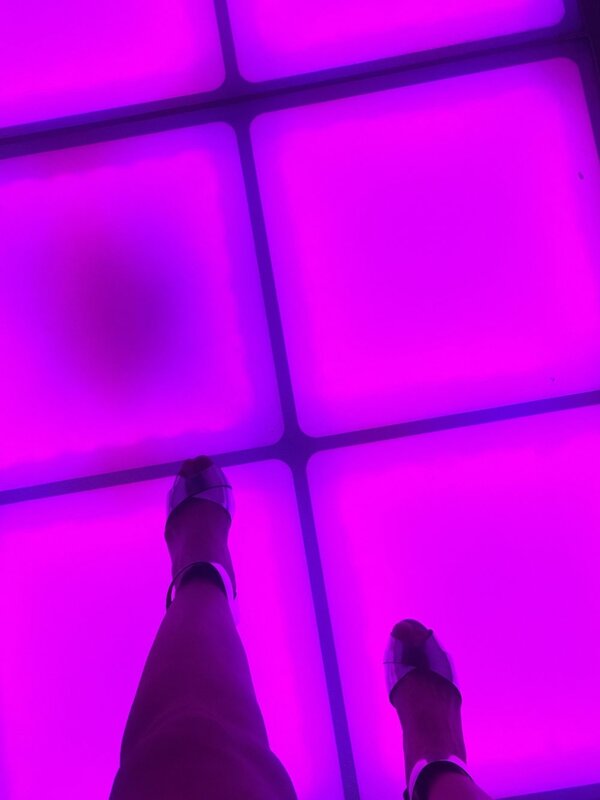 The piece was built inside a booth room with illuminated floors in the style of a 1970s night club, and photographs on the wall captured fragments of Artigas's clothes while he was dancing and performing. The more emerging fairs, Salon Acme and Material, had really interesting positions, including Labor Gallery, based in Mexico City, whose program is rooted in art that reflects current social and political concerns. For example, Mexican artist Hector Zamora who lives in Sao Paulo showed a photograph of a Brazilian government building where workers threw painted black pages of the Brazilian Constitution - a criticism of all the acts of corruption from the government of impeached president Dilma Rouseff. Hector Zamora's critiqye on Brazilian governmental corruption shown by Galeria Labor at Material Art Fair.